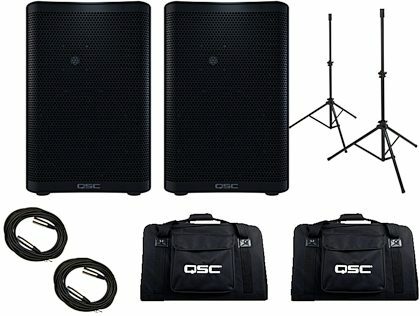 The QSC CP8 compact powered loudspeaker is part of QSC's CP Series. The first thing you will notice about the CP Series is its compact design -- every line, angle and curve working harmoniously to present a stylish, yet rugged, appearance. Inside, CP is equipped with a highly efficient, 1000-watt power amplifier, matching transducers and advanced DSP, delivering performance beyond expectations for a loudspeaker of this size. Overall: These speakers are great! I also own a pair of QSC K series 12.2 speakers. Those are great too but kinda heavy and take up a lot of space. I bought a pair of the CP8s for monitors during full band shows and to use for solo shows. These things kick! Two CP8s take as much room, and weigh less, than one K12.2. I’ve only used for solo acoustic going to test as monitors tomorrow. But hearing these the other day walking around on my break I know they get the job done. Well done QSC. "Amazing sound quality and loudness!" Overall: I bought these to replace some old passive JBL 15" speakers that really didn't sound that great. These sound much better, play louder and are super small and easy to carry abound. They are 500 watts RMS. Bass is punchy, mids are clear and loud and the highs are extended and clear. Style of Music: Mostly electronic but all kinds, really.